Seit Januar 2018 stellen wir Ihnen wöchentlich eine Physikerin in einem kurzen Bericht vor. Möchten Sie selbst Ihr Forschungsgebiet vorstellen oder wollen Sie eine Physikerin in Deutschland oder eine deutsche Physikerin im Ausland (Bachelorstudentin, Masterstudentin, Doktorandin, Postdoktorandin, Gruppenleiterin, Professorin - Physikerinnen aller Karrierestufen können sich beteiligen) für unser Physikerin der Woche Projekt vorschlagen, dann kontaktieren Sie bitte Frau Dr. Ulrike Boehm . Einen Artikel über unsere Aktion in der Aprilausgabe des Physik-Journals finden Sie hier. Das Physikerin der Woche Projekt wird auch in 2019 fortgesetzt. Hier geht es zum aktuellen Physikerin der Woche Projekt. Selina is a Junior Researcher at the University of Cologne where she leads the Surface Science Lab. 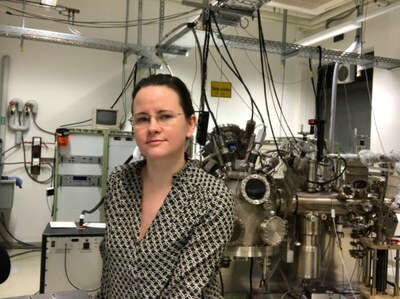 Her research is focused on the method of photoelectron spectroscopy which is used to probe the energy levels in novel materials, such as organic semiconductors or halide perovskites. 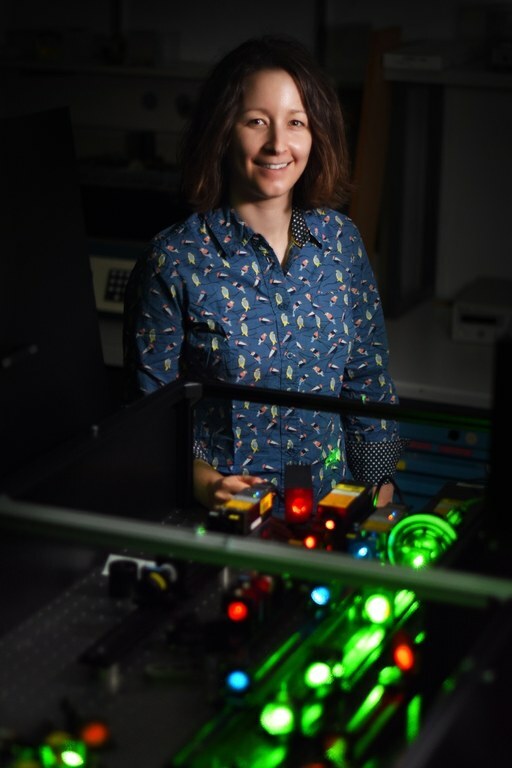 With her work she aims at gaining a deeper understanding of fundamental material properties which helps to shed light on the working mechanisms of optoelectronic devices. 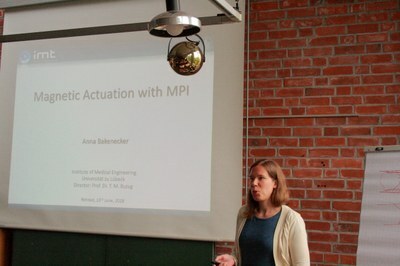 Recently, she was awarded with the Gaede Price of the German Physical Society. 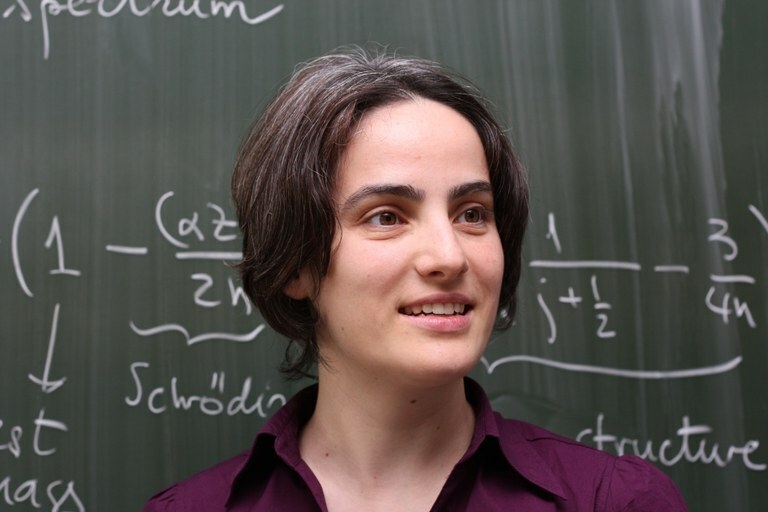 Adriana is the head of the group "Nuclear and atomic quantum dynamics" in the Theory Division at the Max Planck Institute for Nuclear Physics. 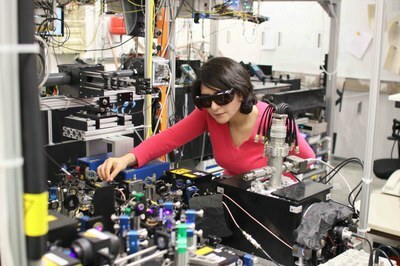 By understanding light-matter interaction at the borderline between atomic, nuclear and quantum physics, she aims at obtaining quantum control over nuclear transitions. What for? A novel nuclear frequency standard, a clean energy storage solution or control over single x-ray quanta for quantum technologies are few fascinating and compelling examples. Daniela Huppenkothen is the Associate Director at the Institute for Data-Intensive Research in Astrophysics and Cosmology (DIRAC) at the University of Washington, and a Data Science Fellow at the University of Washington’s eScience Institute. She works on astrostatistics for astronomical time series, and is interested in how we can get as much information about astrophysical phenomena out of our data as possible, for everything from asteroids to black holes. She is excited about teaching data science to astronomers and researchers from other scientific disciplines, and about finding new ways to get researchers across different scientific domains to talk to one another. 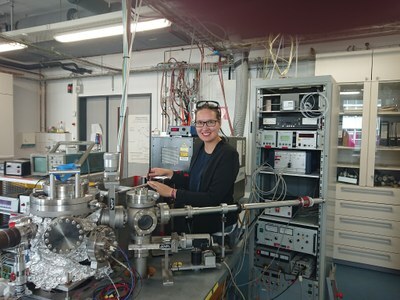 Catmarna is about to start her PhD at the University of Kassel in the framework of the SFB ELCH, where she is working in the field of luminescence and electron spectroscopy, investigating electronic processes in atoms, molecules and clusters. These are excited either by electron impact or photons radiation from synchrotron radiation facilities and FELs. In her master thesis, she developed an experiment for recording photon emission spectra of clusters in the XUV after electron impact excitation. With that it was possible to detect the emitted photons of the so called radiative charge transfer (RCT) in neon after electron impact excitation for the first time. Among other interparticle processes it is discussed as a prominent relaxation pathway in weakly-bound systems with a possible impact on radiation damage in biological systems. The equation of state of nuclear matter is not yet fully understood, especially in the region of high densities as they occur in neutron stars. 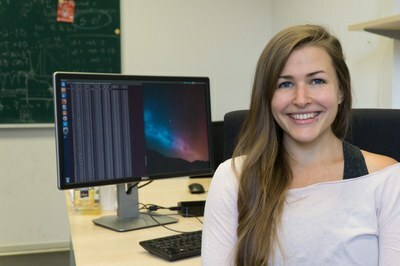 As part of Svenja's doctoral thesis at the TU Darmstadt, she is investigating models of the equation of state and the associated predictions for the properties of neutron stars. Taking astrophysical observations into account, conclusions can be drawn about the radii of neutron stars and the equation of state. Laura is a Feodor-Lynen Reserach Fellow in the Condensed Matter Theory group at Brookhaven National Laboratory. In her research she studies collective phenomena in quantum systems to explore the properties of the different phases of matter and the mechanisms behind their formation. Why, for example, become some insulators perfect conductors under pressure? Or what happens to the electrons when a material undergoes a phase transition to a magnetic state? Carola is a senior researcher and group leader at the Universität Osnabrück. Her research group focuses on spin as well as molecular interactions studied by electronic transport. The transport devices are based on carbon nanotube field effect transistors exploiting the extraordinary transport properties of these quasi one-dimensional conductors. They investigate structural and spin dynamics of molecules grafted to the tubes that reflect in the characteristics of the current through the devices. Jessica has just moved to the University of Manchester to start a lecturership in Functional materials and devices. 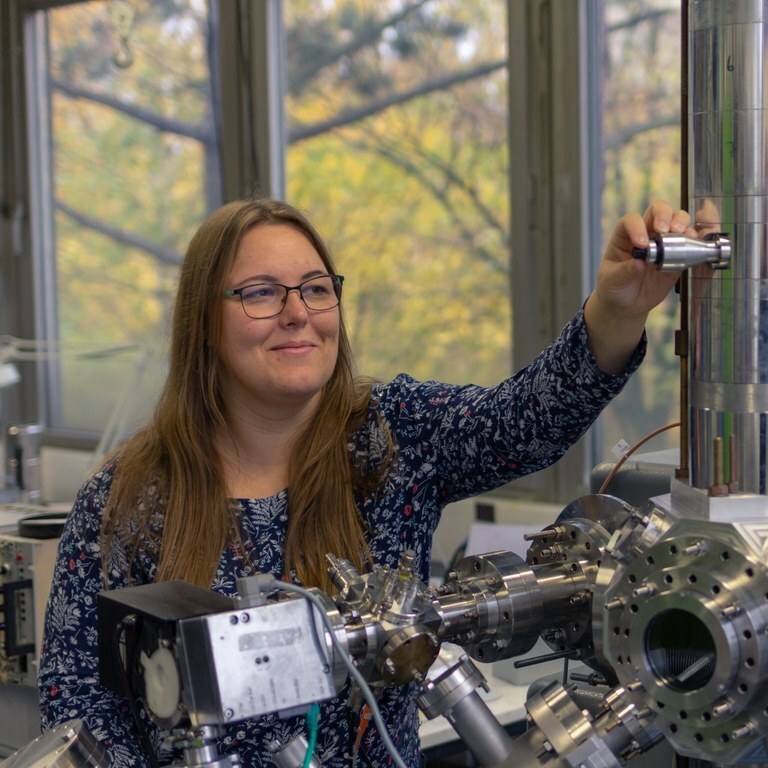 She has moved from the University of Regensburg, where she received a Humboldt postdoctoral research fellowship to investigate the ultrafast carrier dynamics of topological insulators via near-field multi-terahetz spectroscopy. 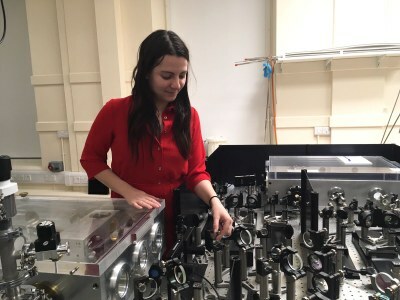 Previously she carried out her PhD at the University of Oxford, where she developed novel techniques based on terahertz spectroscopy for characterising doping concentrations in semiconductor nanowires. She also helped develop novel nanowire-based terahertz devices, including ultrafast optically switchable terahertz modulators. She is currently working on developing near field microscopy in the low frequency terahertz range to investigate the optoelectronic properties of 2D materials and topological insulator nanowires. Anna is a PhD student at the University of Lübeck. She is interested in applying physics for the improvement of medical treatment procedures. The Institute of Medical Engineering in Lübeck is working on a new medical imaging technique: The Magnetic Particle Imaging. It visualizes the distribution of magnetic nanoparticles, used as tracer material. It is a radiation-free, tomographic, 3D real-time technique, which - besides medical imaging - enables to track and actuate small magnetic swimmers. This is Anna’s research field. She develops magnetic swimmers, which can be magnetically guided through the body in order to deliver therapeutics more precisely and reach regions of the body, which are difficult to access. She implements the tracking and actuation procedure with Magnetic Particle Imaging. 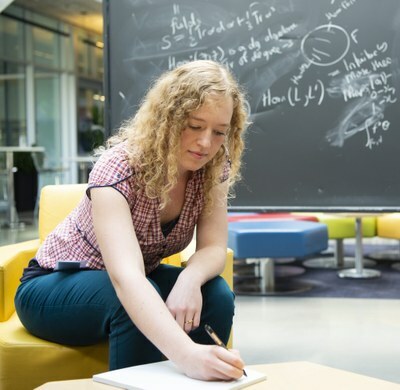 As PhD student at Heidelberg University Annika explores the rich physics of nonlinear quantum optics in Rydberg gases. Due to their huge interactions Rydberg atoms enable the realization of strong optical nonlinearities, which allow for effective photon-photon interactions. These interactions pave the way towards single photon devices and other key elements for all-optical quantum information processing. In her work Annika aims to investigate the spatial characteristics of the emergent optical nonlinearities in the dissipative and dispersive regime. 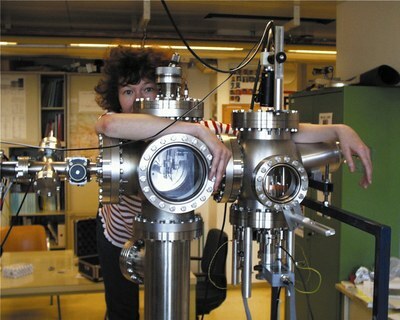 The photo shows Annika in front of the main experimental setup. Christina, Ph.D. Candidate in Astrophysics at Princeton University, is a National Science Foundation Graduate Research Fellow and Presidential Fellow. Her work focuses on understanding the large scale structure of our universe and how we can use it to better constrain theories of the universe’s evolution and its constituents. 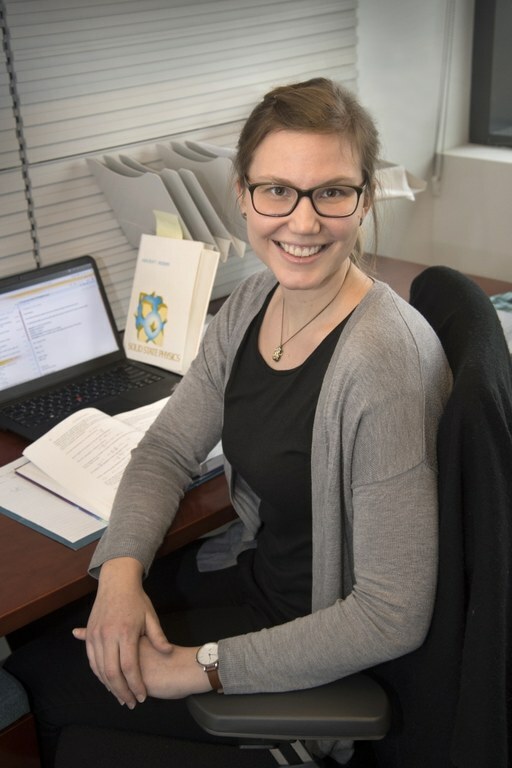 Recently she has worked on probing neutrino properties with cosmic voids and constraining novel neutrino physics with cosmic microwave background and large scale structure data. Chasing theories behind mysterious phenomena drives her: What physics can we learn if we analyze data differently? Some of the most fruitful questions arise when posed at the intersection of different fields and perspectives. 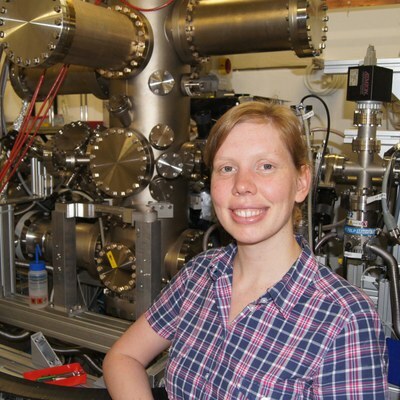 Marina Walt is a PhD student at the University of Tübingen in the field of theoretical nuclear and particle physics. Her research addresses the understanding of the inner structure of protons in nuclei and involves theoretical calculations at high precision, which are then used to compare with data from various experiments in order to determine the momentum distribution in nucleons. 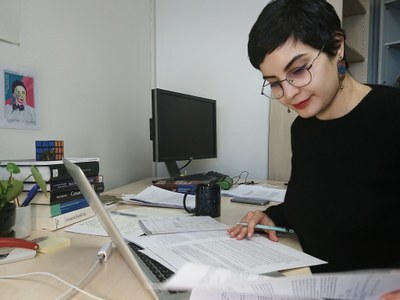 Marina's passion on nuclear and particle physics is spread among several topics of interest, like the concept of Color Glass Condensate and understanding of the Quark-Gluon Plasma. Lena recently moved from the Max Planck Institute for Physics to work as a postdoctoral researcher at the Perimeter Institute for Theoretical Physics in Canada. She develops models beyond the Standard Model of Particle Physics to answer some of its fundamental open questions, such as: What are the origins of neutrino masses and dark energy? Why do the strong interactions treat matter and antimatter on an almost equal footing? Her models suggest that the answers might lie in quantum gravity. Some of her models' predictions challenge our current understanding of the recent evolution of our Universe. An interview (2016) with Lena can be found here. Elizabeth is a theoretical physicist with interest and experience in the field of quantum optics. She finished her PhD at the Universität Rostock and is about to start as a postdoc at the QSTAR institute in Florence. Her studies have been focused on open quantum systems and the characterization of quantum correlations, covering both, discrete and continuous variable regimes. She has a particular interest on working in the border theory-experiment, developing criteria for testing and measuring general quantum correlations in composite systems. The understanding, engineering and control of such correlations are essential to the design and development of quantum technologies --the way towards the next technological revolution! What are the fundamental building blocks of our universe? In Astrid Eichhorn's research, she explores the microscopic structure of matter and spacetime to understand the fundamental constituents of our universe at the tiny scale of 10^-35 m and below. As this length scale is too tiny to probe it with experiments, her research is theoretical. 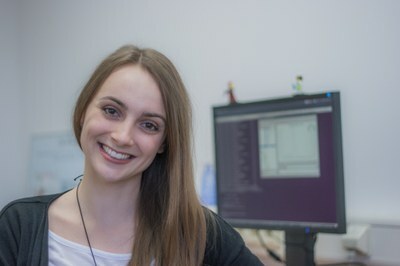 She spends most of her time with her team of PhD students and postdocs, working out equations that they hope encode the microscopic structure of the building blocks of our universe and discussing ideas how to connect the physics at microscopic scales to observable effects at larger scales. The photo shows Astrid with her research group. 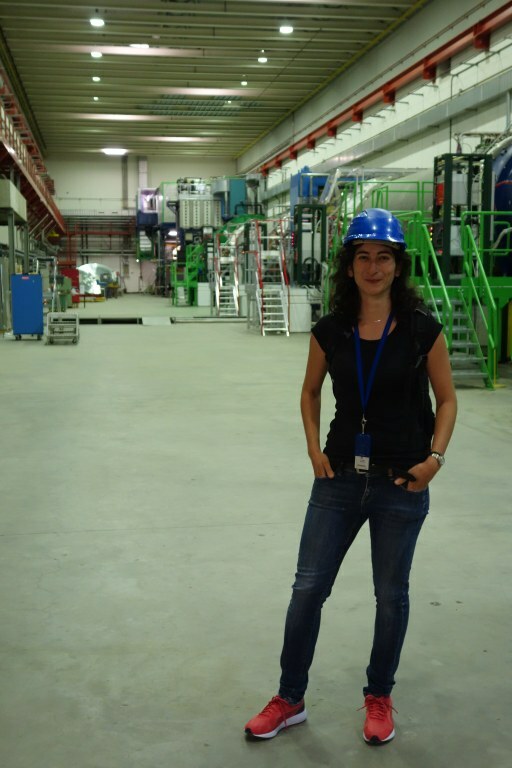 Babette is a research physicist at CERN working mainly with the NA62 fixed-target experiment at CERN's Prevessin site. 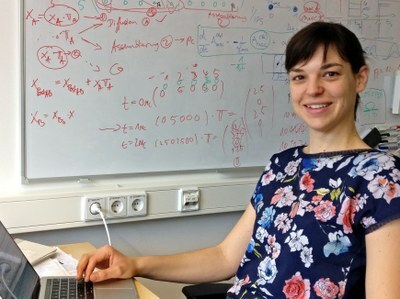 She is interested in searches for light-weight and weakly-coupled particles beyond the Standard Model, and has a particular interest in axions. The photo shows her at the NA62 experiment. Sarah is a junior research group leader at the Institute of Materials Physics at the Georg-August University of Göttingen. Her research group deals with the topic of functional thin films, which can be implemented in electrocatalysis and photovoltaics. For preparing these (multi-)layers the pulsed laser deposition is used. This technique is capable of growing homogeneous films of extremely small thickness on the scale of a few nanometers from a huge range of different materials classes. Among them complex oxides - exhibiting a variety of exploitable electronic states - are in focus of her research activity. On the photo she demonstrates the measurement of the (UV-)laser energy density. Jana is a doctoral researcher at the MPI for Dynamics and Self-Organization in Göttingen. Her focus of interest are the iconic hexagonal patterns that often form in salt deserts, such as the Death Valley. She tries to uncover the driving mechanism of this pattern formation process, using both numerical simulations and experiments in the lab as well as organizing field studies to research the patterns in nature. The photo shows Jana during field studies conducted at Owens Lake, California. Josefine is a theoretical fusion physicist who works as an assistant professor at the TU Eindhoven, NL. Her research focuses on understanding the behavior of turbulence within fusion reactors. 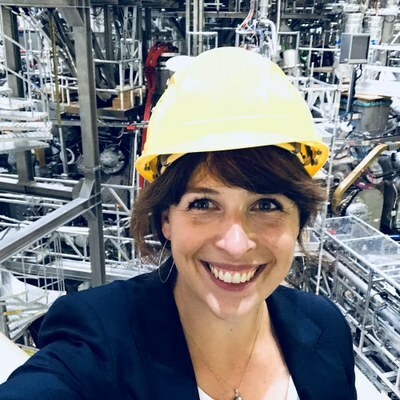 In particular, she looks into how shaping the magnetic geometry of fusion devices of the stellarator type - like the experiment Wendelstein 7-X in Greifswald, Germany - can suppress turbulence and thus lead to better fusion reactors. An interview (2016) with Josefine can be found here. Hannah is a PhD student at the TU Darmstadt, where she works in the field of theoretical astrophysics. Her research focuses on core-collapse supernovae simulations and the equation of state. Core-collapse supernovae are one of the main production sites for heavy elements and are crucial for understanding the origin of elements in our universe. Nuclear matter in these extreme environments is still not fully understood. 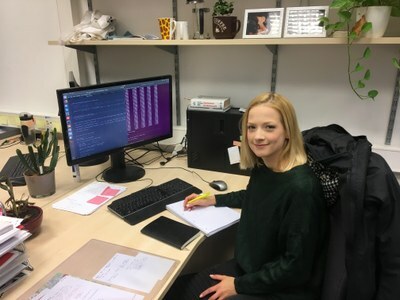 As part of her PhD, Hannah is working together with nuclear physicists at TU Darmstadt to explore how uncertainties in the equation of state impact core-collapse supernovae simulations. Iulia is a postdoctoral researcher at the Max Planck Institute for Solar System Research in Göttingen. She works in the department "Sun and Heliosphere". In her group they developed a nonlinear force-free field (NLFFF) extrapolation method which models the magnetic field of the Sun from its photospheric measurements high up into the corona. In the her work she combined the traditional extrapolation calculation with the information from solar extreme ultraviolet (EUV) imaging data so that a more consistent magnetic field model may emerge. 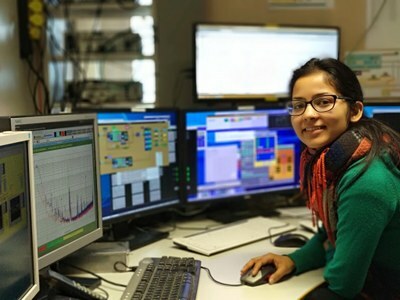 Aparna is a PhD student at MPI for Gravitational Physics (Hannover) working in the on-site team at GEO600, which is the British-German gravitational wave (GW) detector. It is an advanced version of a simple Michelson Interferometer with each arm being 600 m long. 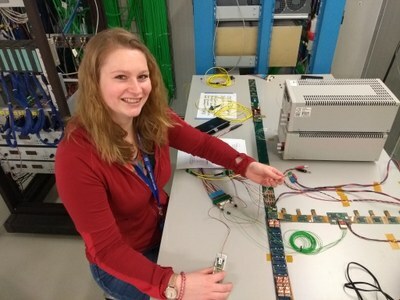 She works on a scheme for automatic alignment of laser beams at the interferometer output which will improve the signal to noise ratio of a potential GW signal. She is also a member of the LIGO Scientific Collaboration that proved the existence of gravitational waves (Nobel Prize in Physics, 2017). Svenja is a PhD student at Uppsala University in Sweden. 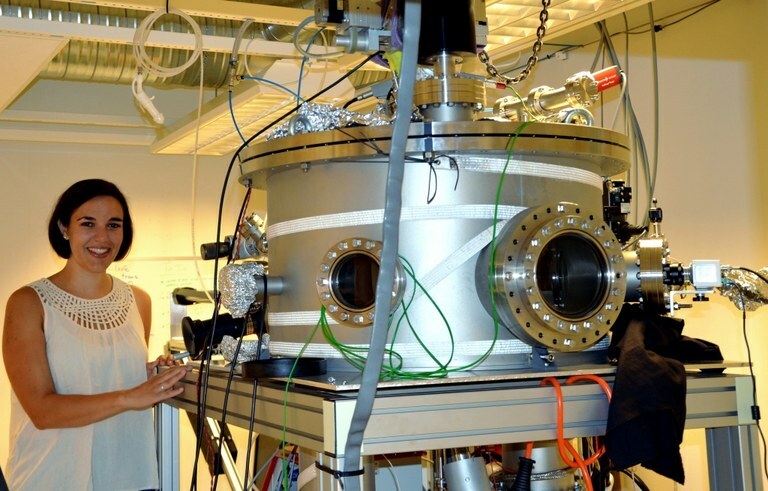 She is doing research on ion-solid interactions by performing scattering experiments with the help of an accelerator. She specifically focuses on electronic interactions in the medium-energy regime (that means around 100 keV) by studying emitted particles such as desorbed ions, photons and electrons. The methods she is using can also be applied for materials analysis, e.g. to determine the composition and thickness of ultra-thin films. The photo shows Svenja next to the experimental chamber, where she does most of her experiments. Kathrin is a postdoctoral researcher at the Leibniz-Institute of Atmospheric Physics (IAP) in Kühlungsborn at the Baltic Sea. She received her doctorate at the University of Rostock and investigated gravity and tidal waves in the Earth’s middle atmosphere with ground-based temperature observations based on a Rayleigh-Mie-Raman lidar (light detection and ranging). Currently, she is developing a new lidar at the IAP to measure winds in the middle atmosphere, where no other instruments can detect wind on a routine basis. This will complete the understanding of the dynamics in the atmosphere and in the end it will help to improve general circulation models of the atmosphere. The photo shows Kathrin in front of a receiving telescope in their telescope hall. 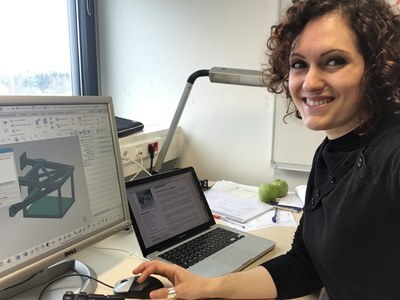 Maria studies symmetries in the world of elementary particles with the Cooler Synchrotron COSY at the Forschungszentrum Jülich. During her PhD, she investigated the effects of quark masses in hadrons by measuring the rare isospin-symmetry-breaking reaction using the WASA-at-COSY experiment. 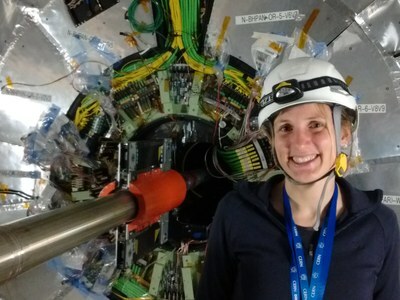 As a postdoc, she joined the activity of the JEDI collaboration in the search for Electric Dipole Moments (EDM) of particles at storage rings, which can shed light on the mystery of Matter-Antimatter imbalance in the Universe. Maria won the Jülich Excellence Prize 2018 for her PhD thesis (Laudatio by Prof. Dr. Hans Stroeher). Here you can find a video of Maria describing her work. Kristin is a postdoctoral researcher in the Laboratory of Nanoscale Biology at EPFL in Switzerland. She received her doctorate from Heidelberg University working in an interdisciplinary single molecule spectroscopy group. Currently, she is extending her quantitative microscopy expertise to 3D super-resolution and phase imaging. As a Horizon 2020 Marie Sklodowska Curie fellow, she collaborates with neurobiologists to investigate Parkinson compromised neurons. In their research, they apply and develop advanced microscopy and image analysis to uncover the underlying molecular mechanism of the disease. 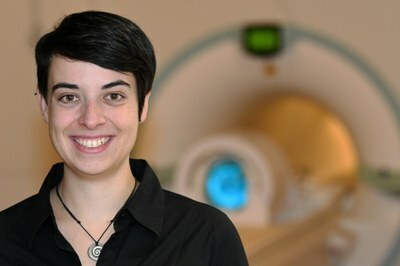 After studying Physics and Engineering in Karlsruhe (DE) and Grenoble (FR), Eva Oberacker started working in the field of Ultrahigh Field Magnetic Resonance Imaging (UHF MRI) for her diploma thesis at the Berlin Ultrahigh Field Facility, where she then started her PhD in 2015. Her research focus shifted to the development of an integrated applicator for RF Hyperthermia of brain tumors such as Glioblastoma Multiforme (GBM). The team in Berlin proposed a new approach by combining the RF technologies used for deep hyperthermia and UHF MRI. This allows the combination of diagnosis (MR Imaging), therapy (RF Hyperthermia) and therapy control (MR Thermometry) in the same hardware, paving the way for the treatment of such delicate structures as the brain. Rowina is a masters student at the university of Hamburg. Currently, she is doing an ERASMUS year abroad at the AGH in Krakow. During her bachelor thesis she worked on analyzing Higgs decays into muons with data from the CMS experiment at CERN. Although the existence of the Higgs boson is counted as an established fact in particle physics, its properties are still under research. The decay into second generation particles like the muon is one of these yet unproven properties. 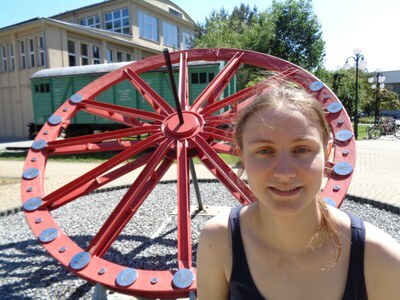 The photo shows her on the AGH campus in front of the big sun clock made from an old railway train wheel. Anna is a PhD student in the Biophysics Group of Prof. Klenerman in Cambridge. Her research project is a collaboration with the Immunology group of Simon Davis in Oxford where she examines the effect of pharmatceutically relevant antibodies on the immune system. Antibodies are widely used for the treatment of diseases and while their efficacy is shown, little is known about the underlying mechanism. Anna uses Single-molecule Imaging to examine the influence of antibodies on single proteins and protein distributions on the cell membrane of immune system cells. 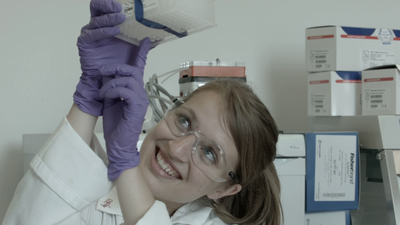 Kerstin is a Marie Curie Fellow at the Max Planck Institute for Medical Research in Heidelberg. In the Department of Cellular Biophysics, she works on the bottom-up assembly of synthetic cells. Combining DNA nanotechnology and microfluidics, she is working towards more and more complex systems with life-like functionality - fascinated by the vision to create an entire living cell from scratch. Johanna is a high-school student. 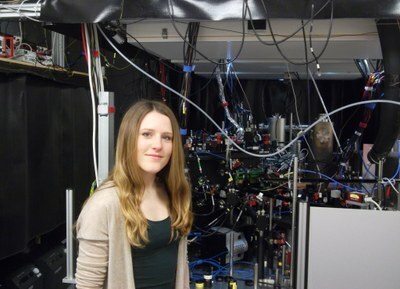 She has done her high-school praktikum in the research group of Prof. Ferdinand Schmidt-Kaler at the Johannes Gutenberg-Universität Mainz, where she set up a cavity for a He-Ne laser system. 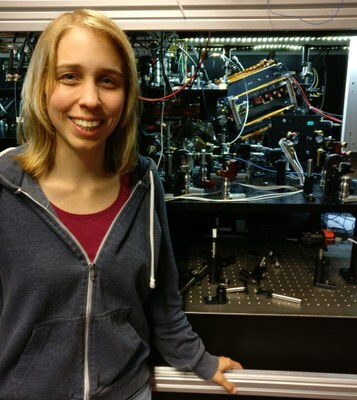 Through her work with this setup, she has learnt about laser principles, which are central for quantum optics experiments. The photo is showing her while adjusting the laser cavity in a laboratory of Prof. Walz. 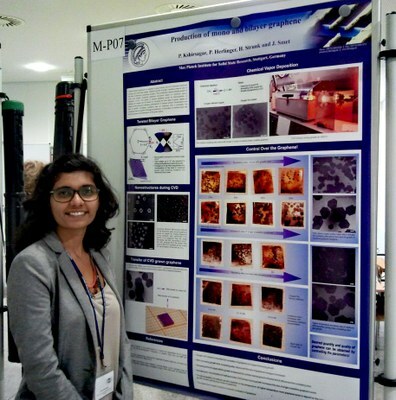 Pranoti, originally from India, moved to Germany for her master's degree at the MPI, Stuttgart. She is currently pursuing her PhD studies at the NMI Natural and Medical Sciences Institute (NMI) at the University of Tübingen. Pranoti's thesis focuses on fabricating transparent graphene microelectrode arrays (MEAs) for electro and optophysiology. The idea is to grow the graphene and integrate it in the MEA technology and demonstrate the ability to record signals from cells such as cardiomyocytes and neurons. In the picture Pranoti is next to her first ever poster presentation. Arezoo is a postdoctoral researcher and a Marie Curie fellow at the University of Mainz. Currently, her research focuses on Rydberg excitation of cold trapped ions. 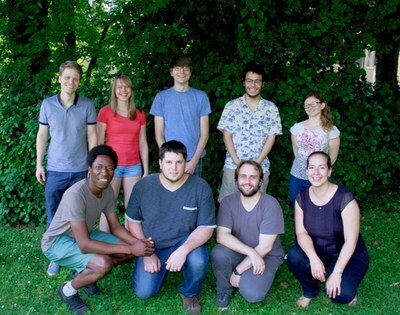 This project aims at combining advantages of trapped-ion quantum bits with tuneable Rydberg interactions between high-laying Rydberg states of ions. These systems offer new possibilities for investigating many-body physics in an extremely precise fashion as well as for observing novel quantum effects. 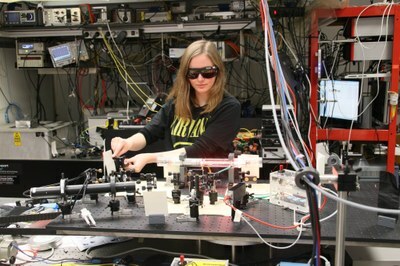 The photo shows her working in the Rydberg ions lab. Shreenanda Ghosh is a PhD student at the Institute of Solid State and Materials at the TU Dresden. She is working with one of the most compelling unconventional superconductors till date, Strontium Ruthenate (Sr2RuO4). By combining Muon spin relaxation (which is an unique tool to study structural and dynamical processes that are taking place in the bulk of a material in an atomic scale) and the application of uniaxial pressure (which is a good way to perturb a material without introducing any disorder) she is searches for a conclusive evidence regarding the superconducting order parameter of Strontium Ruthenate. For this purpose her group has developed an uniaxial pressure device which is expected to widen the range of applications of Muon spin relaxation method. 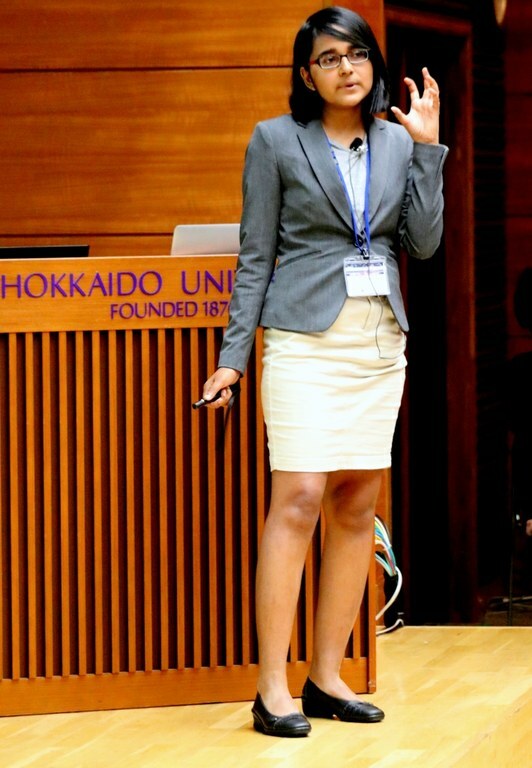 The photo shows Shreenanda at her first conference talk at The 14th International Conference on Muon Spin Rotation, Relaxation and Resonance (µSR2017) held in Sapporo, Japan. Jory is a postdoc and works in operations of the CMS pixel detector at CERN. This detector was recently repaired and reinstalled, and she now helps to calibrate it and monitors the conditions to ensure the safety of the detector and quality of the data. Operating a detector is a very exciting job where there is always a need to solve unexpected problems. 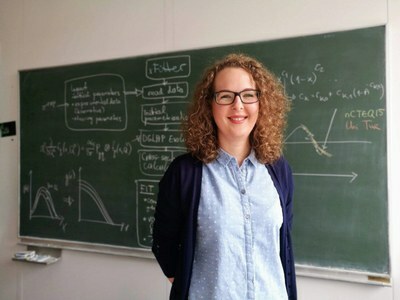 Jory did her PhD in Aachen in theoretical particle physics, but now she is a postdoc in experimental particle physics at the University of Hamburg in experimental physics. She lives and works in France close to the CMS detector at CERN. Originally she is from the Netherlands. Ille from the Institute of Applied Physics at the Vienna University of Technology in Austria is an experimental physicist who combines science, industry, jungle and outreach in her work. From 2008 until 2015 she lived and worked in the tropical country Malaysia in South-East Asia, where she learnt at various rainforest expeditions a lot about Nature’s secrets on the nanoscale. Her ideas from the expeditions she is now turning into reality at her home institution in Austria, via biomimetic principle transfer. 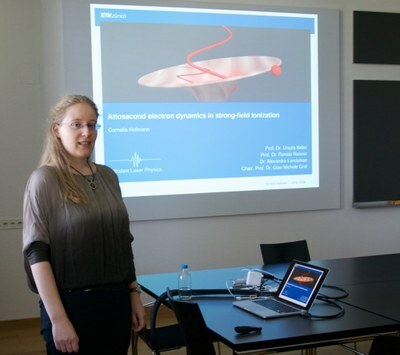 Kirsten is currently an Ewald fellow of the Volkswagen foundation working on research with Free-Electron Lasers. She explores the dynamics of molecules on the femtosecond time-scale with high-energetic laser pulses from the XUV to the X-ray regime. Using high-energetic photons for time-resolved experiments offers the advantage that specific atoms and states within a molecule can be probed which allows to follow charge- and energy-transfer in real time with atomic resolution. Zara is a Postdoctoral researcher in the neutrino group at IKP-2, Forschungszentrum Jülich. She received her PhD within the Cotutelle agreement between University of Cologne (Germany) and Tbilisi State University (Georgia). Nowadays she is mostly busy hunting neutrinos coming from the Sun and arriving at Laboratori Nazionali del Gran Sasso (Italy). Even though billions of solar neutrinos pass every second through your thumb, an extremely low interaction probability makes researching neutrinos a very challenging quest. Zara is a member of the Borexino collaboration, that utilizes detector with the most radiopure scintillator in the world, located in the largest underground laboratory in the world. An interview (2016) with Zara can be found here. Birgitta recently became a junior professor at the Institute for Applied Physics of the Friedrich Schiller University Jena. The professorship is funded by the Carl Zeiss Foundation. 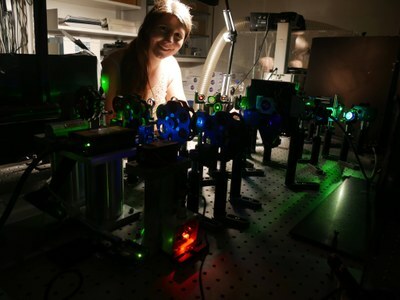 Birgitta’s research is devoted to absorption spectroscopy in the (extreme) ultraviolet region with ultra-high spectral resolution (relative resolutions up to 10^-9 via dual comb spectroscopy) and ultra-high temporal resolution (attosecond resolution via pump-probe spectroscopy). An interview with Birgitta (while she was a postdoctoral researcher at the Technical University of Munich (TUM) in 2016) can be found here. Karen is doing her PhD in the Quantum Optics Group at the Ludwig-Maximilians-Universität in Munich. During her PhD she is investigating ultracold Potassium atoms in an optical honeycomb lattice. In particular, they are interested in exotic phases of matter, formed by strongly interacting particles in topologically non-trivial energy bands. Janine is a PhD student at the University of Mainz. She is interested in experimental quantum computation. She works with a segmented micro-structured linear Paul trap to store 40Ca+ ions. Quantum information is encoded in the Zeeman sublevels of the ions and quantum gates are performed by lasers. Ion crystals are split, merged, swapped and transported to form the basis of a scalable quantum processor. The photo shows her in the quantum computation lab of Prof. Dr. Ferdinand Schmidt-Kaler at the Johannes Gutenberg-Universität Mainz, which is one of the most pioneering labs in this field in the world. 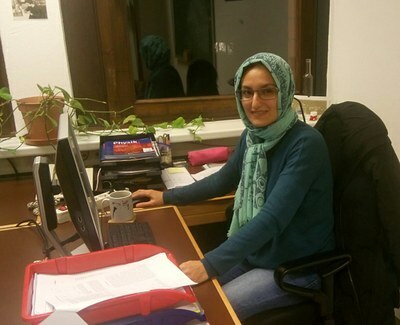 Zahra is a PhD student at the University of Oldenburg. She is a member of the Models of Gravity Research Training Group. In this Research Training Group they discuss various string theory motivated gravity models given by various generalized Einstein equations. First they derive and discuss solutions of these generalized Einstein equations, then they explore the resulting space-times through the motion of test objects, and finally they also apply the results to astrophysically and cosmologically given situations. Zarah is working on alternative theories of gravity in neutron stars. Neutron stars are one of the most fascinating objects in the universe created by the collapsed core of a giant star. They are incredibly dense and compact objects representing an ideal laboratory to test alternative theories of gravity. Karen did her PhD thesis in Paris Observatory (she is French), then she came to Germany (Göttingen) for a post-doc at the Institut für Astrophysik (IAG). She works on ELT instrumentation (European Extremely Large Telescope). In the frame of the MOSAIC Phase A project (Multi-object spectrograph for the ELT), she simulated (with an end-to-end simulator that she contributed to develop) the observation of high redshift galaxy spectra with the instrument. These simulations are used to define the high level specifications of the instrument and to evaluate the impact of design trade-offs on the instrument performances. 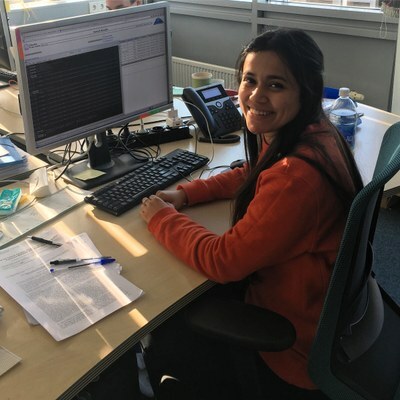 As she is part of the engineer group at IAG, she recently also started to work on Finite Element Analysis of support structure for different spectrographs that will be mounted on the European telescopes in Chile. Andrea is a group leader at the Max Planck Institute of Colloids and Interfaces in Potsdam. Her group works on multiscale simulations of biological and biomimetic molecules. Currently, they are particularly interested in the development of reliable models of biological carbohydrates. The diverse and complex functions of these molecules for cell biology are only just beginning to emerge and open up a multitude of questions related to their molecular interactions and structure-function relationships. Ulrike is a group leader at the Max Planck Institute for Terrestrial Microbiology in Marburg and member of the German Young Academy. 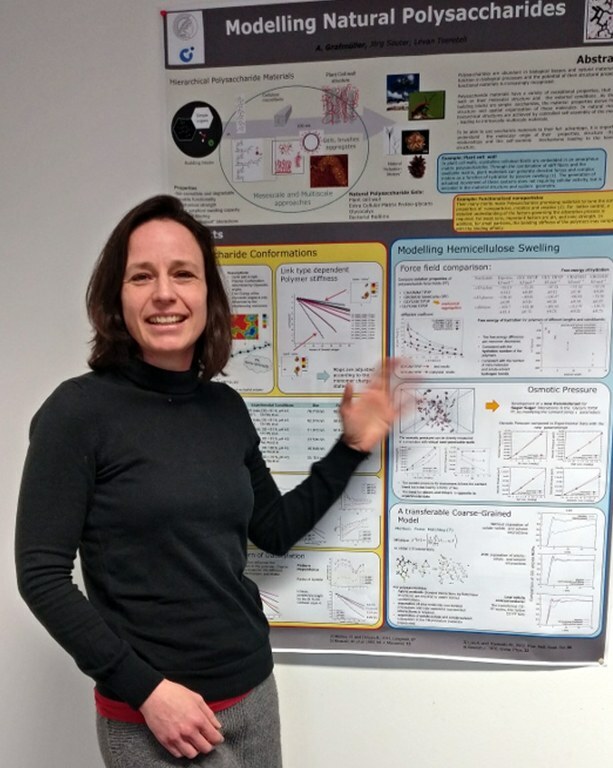 Her group specializes in the in situ observation of molecular processes underlying cellular functions in microorganisms and combines biological research with technological innovation to gain a basic understanding of how complex interdependencies of single molecules enable life. Focusing on the two microbial model organisms E. coli and S. pombe, Ulrike and her group apply and develop two key super-resolution microscopy technologies: studying fast and heterogeneous cellular dynamics using single-particle tracking (SPT) techniques and revealing the structure of complex multi-protein assemblies using Single-Molecule Localization Microscopy (SMLM) imaging. 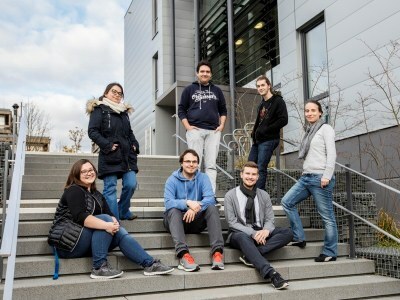 The photo from November 2017 shows Ulrike (right) and her group in front of their department. Cornelia a postdoctoral researcher at the Max Planck Institute for the Physics of Complex Systems in Dresden. 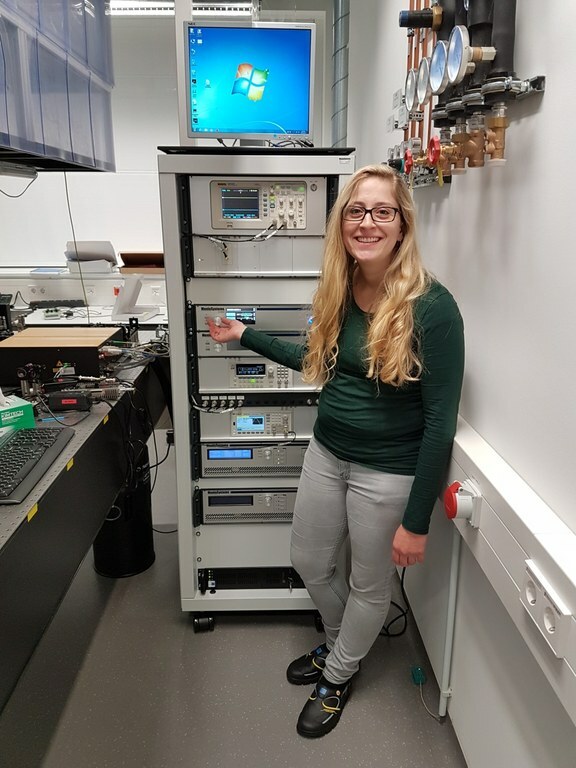 She studies the interaction of strong ultrafast laser pulses with atoms, which allows them to investigate electron wave packet dynamics both during the strong-field ionization process and during the subsequent propagation of the photoelectron. Ionized photoelectrons can take part in many different phenomena, such as creating highly excited Rydberg states, or contributing to High Harmonic Generation. This fundamental research helps understanding ultrafast charge transport in a variety of process, for example during chemical reactions or in photovoltaic cells. The picture shows her during her doctoral defense. An interview with Cornelia can be found here. Sophia is a group leader at the Max Planck Institute of Colloids and Interfaces in Potsdam. She is a theoretical biophysicist working on mathematical models of biomolecular processes. Currently, her research focuses on the synthesis of proteins by molecular machines called ribosomes. 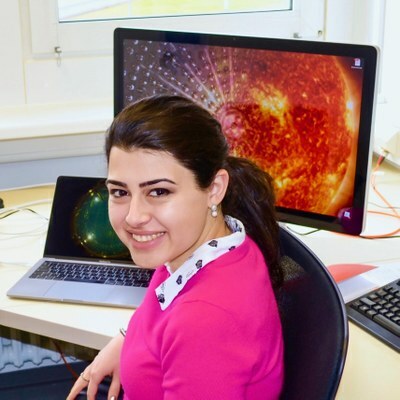 Leila is a PhD student at the Max Planck Institute for Astrophysics in Garching/Munich. 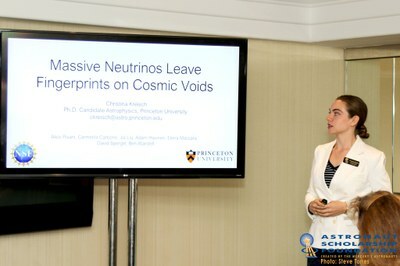 During her Ph.D. she is looking at the effects of massive neutrinos on structure formation and their clustering in the vicinity of Earth, these results are very important for future experiments aiming at detecting the cosmic neutrino background predicted by the big bang model. Amelie is a Postdoctoral researcher at the Ludwig-Maximilians-Universität, Munich. Her work is focused on different applications of DNA origami. One goal is to develop a new method for DNA sequencing, another is the controlled formation of 3D DNA crystals capable of hosting large guest molecules such as gold nanoparticles or proteins, which could serve as new metamaterials or open up paths to optical super-resolution-based protein structure analysis and CryoEM tomography. The picture shows her in the lab, pipetting DNA staple strands that will be used to form the DNA origami. Miriam is a PhD student at the Max Planck Institute for Gravitational Physics in Hannover. She is a member of the LIGO Scientific Collaboration since February 2015 and she analyzes data from gravitational-wave detectors. Currently, she is also working on tests of General Relativity using real gravitational-wave signals from black-hole binaries. The photo was taken at the first meeting of the LIGO Scientific Collaboration and the Virgo Collaboration (March 2016) after the publication of the first observation of a gravitational-wave event, GW150914 (February 2016). 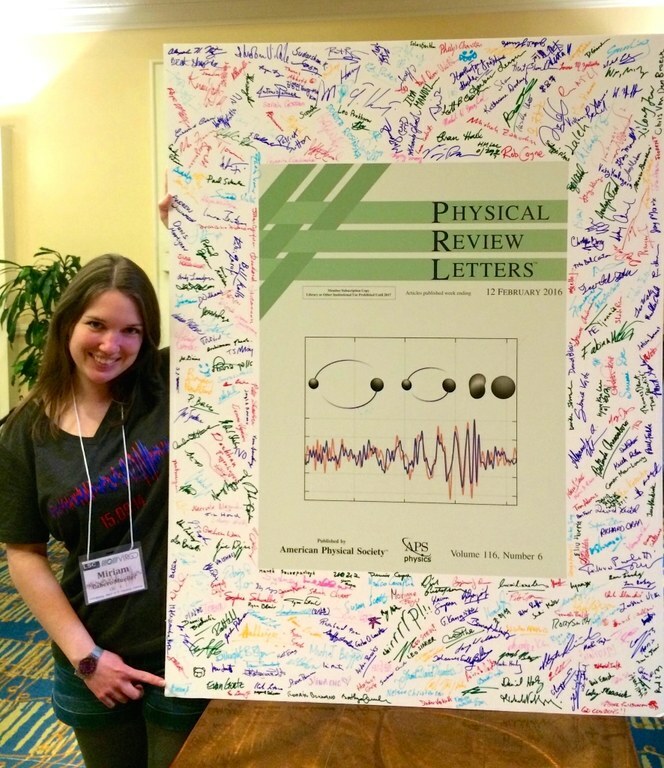 In the picture Miriam is holding the cover of the scientific publication, which was printed on a cardboard and signed by all the co-authors present in that meeting. She is pointing to her signature. An interview with Miriam can be found here. Shweta is an Indian astrophysicist who started her PhD at the Max Planck Institute for Extraterrestrial Physics (MPE) in Garching in September 2017 after finishing her master thesis at the University of Manchester, UK. She studied the spectrum of supernova remnants at high radio frequencies for her masters. Now, as a part of the high energy group at the MPE, she is continuing her research with supernova remnants in X ray frequencies. 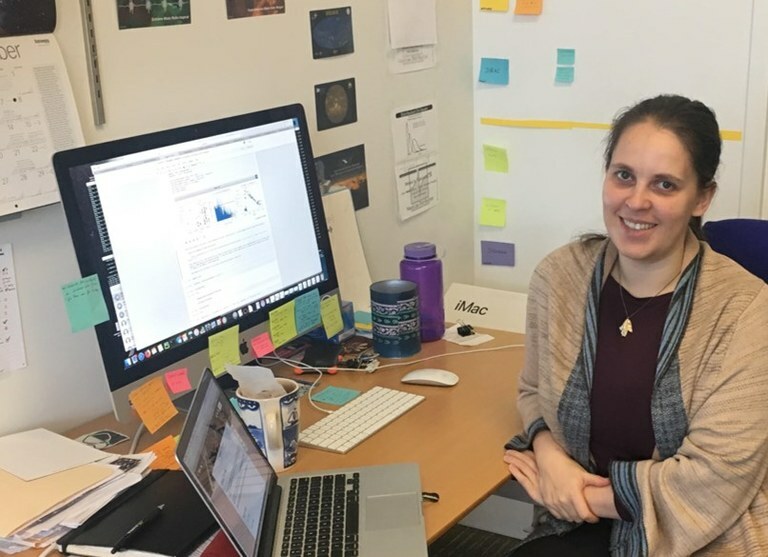 Her aim at the moment is to analyze the XMM and Chandra data for supernova remnants (SNRs) to look into the open questions on the internal structure of neutron stars. 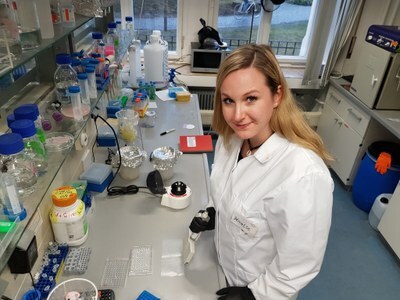 Anna ist Doktorandin in der Teilchenphysik an der Universität Hamburg. Normalerweise analysiert sie Daten des CMS Experiments des LHCs in Genf am CERN, momentan jedoch arbeitet sie selbst am Detektor. Auf dem Bild seht ihr sie an einem Versuchsaufbau. Anna is a PhD student in particle physics at the University of Hamburg / Universität Hamburg. Normally she is analyzing data from the CMS Experiment at the Large Hadron Collider (LHC) near Geneva (CERN), but at the moment she is working at the detector itself. In the picture you can see her at a test setup that they are building up at the moment.